Samidoun Palestinian Prisoner Solidarity Network urges all friends and supporters of Palestine and the Palestinian prisoners’ strugle for freedom to join in the international week of action on 15-22 October in support of Georges Ibrahim Abdallah, Lebanese Arab struggler for Palestine, imprisoned in French prisons for over 32 years. Georges Abdallah’s case has built significant support in Lebanon and in France, and Palestinian prisoners have highlighted the importance of Abdallah’s case as part of the struggle of the Palestinian political prisoners for freedom and liberation. Abdallah was sentenced to life imprisonment in France, accused of participating in actions in France targeting U.S. and Israeli interests during the Israeli invasion and occupation of Lebanon. During his arrest and trial, one of his original lawyers was a spy against him, working for French intelligence. He has been eligible for release under parole since 1999; he has been repeatedly refused, and at times when his release to Lebanon has been approved by the French judiciary, the highest forces of the state, including then-Interior Minister Manuel Valls – with the clear involvement of the U.S. government, including the personal intervention of Hillary Clinton – have intervened to keep Georges Ibrahim Abdallah locked up in French prison. Throughout his time in prison, Georges Ibrahim Abdallah has remained politically active and, indeed, a leader, extending solidarity and full support to struggling prisoners and peoples’ movements around the world. He and fellow prisoners – Basque and Arab, among others – in Lannemezan prison returned their meals in solidarity with Palestinian hunger striker Bilal Kayed, and he has previously participated in hunger strikes in solidarity with Palestinian individual and collective strikes for justice and freedom. He recently expressed his solidarity with Toulouse BDS activists under attack and has constantly remained an active thinker on Arab, Palestinian and international liberation struggles. He has always refused to in any way capitulate or renounce his political vision and commitment to the Palestinian cause, to the people of Lebanon, and to international struggles for liberation. He remains a committed anti-Zionist, anti-capitalist and anti-imperialist. In part because of that very refusal, he remains today imprisoned in the French prison of Lannemezan. The imprisonment of Georges Abdallah comes alongside the persecution and arrest of BDS activists in France for urging the boycott of Israel in solidarity with the Palestinian people, ongoing racist targeting of Arab and Muslim communities in France and the “state of emergency” being used to repress popular movements for justice, while the French state promotes itself as a supporter of “peace” in the region while acting directly in support of the Israeli occupation and Zionist colonization. We urge friends and supporters of Palestine around the world to organize events and protests and engage in actions on 15-22 October for the freedom of Georges Ibrahim Abdallah and all Palestinian prisoners, and to join in the collective march on 22 October in Lannemezan at 2 pm outside the prison, demanding the immediate release of Georges Abdallah. In fact, in 1985, the French government agreed to a prisoner exchange – to release Abdallah in exchange for a captureed French diplomat. Instead, the diplomat was released – and Abdallah remained in prison. His own original lawyer was in fact a spy working for the French state and reporting on him to the highest levels of French intelligence; all of which was used against him in court. People throughout France and around the world have campaigned for his freedom for decades. His brothers and loved ones in Lebanon lead the International Campaign to Free Georges Ibrahim Abdallah. He is considered as part of the Palestinian prisoners’ movement by Palestinian prisoners in Israeli jails. His case represents also the coherence of U.S., Israeli and European colonialist interests in the imprisonment of Palestinian and Arab strugglers for liberation and the attack on the Palestinian people. 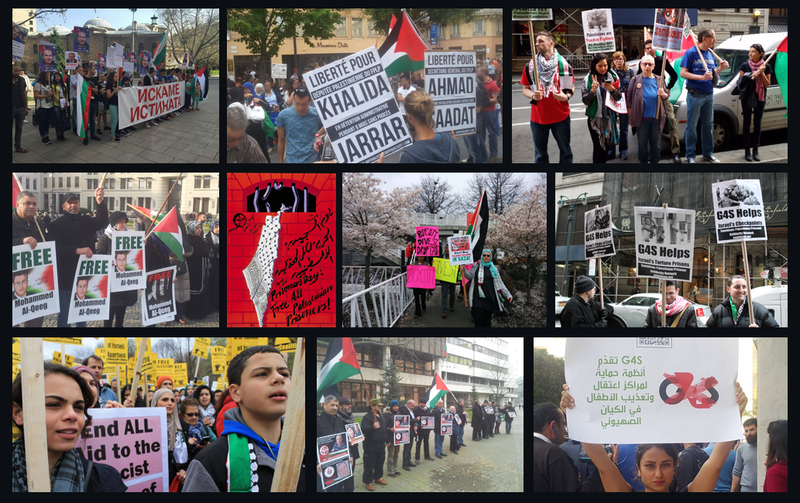 ACTIONS AND EVENTS TO FREE GEORGES ABDALLAH! 7 pm – Solidarity with Georges Ibrahim Abdallah, French Embassy, Istiklal St.
Download Materials for Your Events for Georges Abdallah! Muhannad al-Halabi's mother arrested by Israeli occupation forces, detained for "Facebook incitement"